Don’t forget that political power is intrinsically linked to organizing power. For labor, the January after a presidential election is always a bitter one. 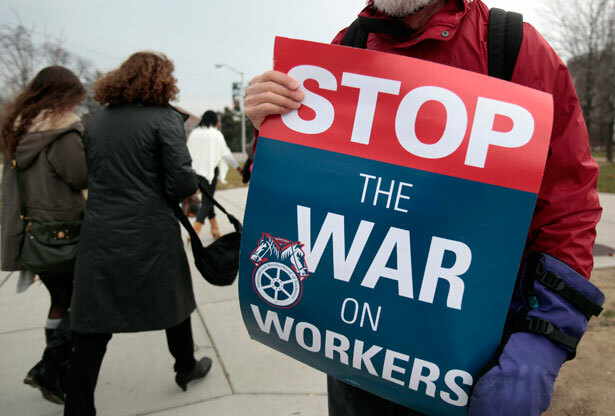 First, unions must face the grim reality of anti-labor legislation passed in the midst of any national election victories. Then the annual union-density numbers come out, typically showing a steeper drop in unionization than in nonelection years—the cost of transferring organizers and resources from unionization fights to political campaigns. In the years that follow, unions tend to get their organizing back on track, so it levels out—but always on a slightly downward trend. Over the past four years, something worse happened. The decline in organizing activity that started in 2008 never leveled out, because unions kept a large number of their organizers in election/legislation mode for four years: from the 2008 campaign, to the failed effort to pass the Employee Free Choice Act, to the 2010 midterms, to the public sector legislation fights in the states, to getting ready to re-elect the president in 2012. For all of the major organizing unions, politics and labor-law reform became a higher priority than organizing. When political and labor-law reform strategies didn’t produce immediate success, many in the labor movement took it as a cause for despair: they had tried everything they could, and they had lost. But in fact, they had forgotten the most important lesson about union political power: that it is intrinsically linked to organizing and bargaining power. A union has no political power unless it has active members who are engaged with their union and their community, and who will fight for their right to organize and bargain collectively. Similarly, unions have no bargaining power or political power unless they’re constantly organizing, because they need members in every state and every district, and they need them to be strong union members who are educated about the issues and ready to talk to their neighbors. Labor has very powerful enemies, but never before has it had so many allies who are equally angry at those same enemies. What the movement has to do is commit the financial and staff resources to recruit, train and coordinate organizers, and to run creative, multifaceted, strategic, comprehensive and (where necessary) global campaigns. This includes ongoing strategic corporate research. And it requires the involvement of labor and community allies, rank-and-file members on the organizing committees, and existing union members serving as volunteer organizers at every level of the campaign. Last, labor needs to unite. The worst news this winter is not about numbers, or bad legislation, but rather that some of our most effective union organizers are going to be fighting over already-organized workers in two or more major inter-union battles. Instead of spending one more cent fighting each other, unions ought to be spending their resources on unorganized workers. Those are the people who really need them. And the rest of the nation needs a strong, united labor movement to take on the corporate right—now more than ever.